I am in awe of Sarah. She’s a lady who can do stuff with her hands (as apposed to me, a man, who struggles to change a plug.). She lives on board a widebeam with two of her three children on the Leeds/Liverpool canal. My name is Sarah, and I have two daughters, one son, a terrier cross called Abby and two cats. My eldest daughter has left home, and the two younger ones spend 2½ days a week with their dad. I’m a forty-something writer, based in the North West, and I’ve been living aboard for nearly nine years now. When we decided to get the boat, my then-husband was working as a locum physiotherapist, and we were moving area every six months or so. We’d sold our house the year before, and had narrowed our options to a boat or a wreck of a house in France. As he had the career, but couldn’t speak French and I could speak French but was at home with the children, the boat won out. It’s very rural, looking out over fields, with just a few cottages by the locks where the Rufford branch starts, but a ten minute walk from Burscough village. We were lucky to get this when we did. The number of available moorings has shrunk, and of course they’ve now gone over to the auction system. She’s a 58’ widebeam (12’) canal boat, with a cruiser stern. We had the boat built for a very reasonable price, about £80,000, I think. (The boat builders went bust whilst they were working on the boat after ours, so maybe it was a little too reasonable!). We had about two-thirds of this from our house sale, and financed the rest with an unsecured loan. All year round, though I tend to spend a couple of days a week at my boyfriend’s flat in Manchester. Yes. I’m a freelance writer and run my own copywriting business. I also invigilate for exams at a local FE college. And I home educate my two younger children. Getting down in the engine room when it’s cold and dark! Where do I start? I love where we’re moored, and would never be able to afford a house around here. I like the potential for moving, even though we rarely do. The people are brilliant, the lateral community. I like having an unusual lifestyle, and this just fits. I’m really happy. I don’t really do much cruising. The kids have things on all the time, and we don’t have enough spare time to relax and just journey. Maybe in a few years. When I do move, it’s for a purpose, such as going up to Wigan for the dry dock. There’s always a town or village within walking distance. I’ve got a washing machine. I’ve also got a range (like an Aga) with a drying rack above it, so there’s never any problem drying clothes. I started out with a pumpout and macerator. There’s not anywhere that close, so it took two days to go up, pump out manually, and come back. And that was in the midst of an already busy life. Then the nearest sanitary station stopped allowing self pump out, and we had those incredibly cold winters so the tank froze solid. It was a nightmare! Next, I tried a cassette. Well, actually, it was a Portapotti which I borrowed when the tank froze, and we kept on using. That was ok, I could strap the container part on the back of my bike and cycle up to the village. Also, it meant that we could take the tank out and use the space. It was under my daughter’s bed, and REALLY heavy. I’d always been interested in a compost loo, but two things put me off. Our next door boat neighbours had a Envirolet compost toilet that was horrible. It smelled disgusting, and kept overflowing. They are designed to evaporate off the liquid, but it really didn’t work. Then I found out about separating toilets, where the liquid and solid are, well, separated, which means you don’t get the smell issue. But even the economy version of this (made by a Swedish company called Separett) was going to cost several hundred pounds. (These are great toilets, and look pretty much like a normal loo). Then someone told me that you can buy a separating seat and make your own compost loo for a fraction of the price. I’ve had mine since October, and it’s the best toilet yet. You can read about how I did it on my website, by following the link at the end. We started off with a dongle from Three, which was ok, but we were always tipping over our allowance. Now I tether my phone (also through Three), from which we have unlimited allowance, which is great. I don’t have the widest knowledge, really, and there’s a lot I’d like to explore one day. I love where we are, but last summer I spent a few days on a friend’s boat when she moved from Macclesfield down to Honeystreet. I was with her for three days on the Trent and Mersey, which was beautiful (with such dinky locks! Nothing I’d get my boat through), and then again on the Thames. It was the first time I’d sailed on river, very enjoyable, all that space. We don’t have hook-ups at the mooring, so it’s diy all the time. I have a 5kw diesel generator, which we use quite a lot. That charges a bank of four leisure batteries. I can also use my main engine as a back up, when necessary. I’ve just made my first solar panel (again, you can read about it on my website), and am planning on a whole lot more. Freezing when I wake up, gradually rising to boiling in the evening. The boat heats up very quickly. We started off with underfloor heating, coming off the range, but that was stupid. For it to have worked effectively, we needed to leave the range on all the time, which drained the power too much. Plus you just end up heating the water… The range is on at a low temperature all day, which gives a nice background warmth. I also have radiators and a multi fuel stove (and an obsession with collecting wood whenever I see it!). We’re pretty comfortable. That’s a tricky one. I’ve met a few people over time who thought that living on a boat would be the best thing ever, and then totally hated it. I could say try it out first, but I’d never even been on a narrowboat before we made the decision to get one, and only had one day doing an inland helmsman course before moving on. You don’t have much space, so you need to be comfortable with proximity. On the bonus side, my kids have never been able to flounce off and slam doors! You need to get used to having your own little ecosystem: you can’t leave the tap running while you brush your teeth, or have loads of light on. Never move onto a boat because your other half wants to. Being on a boat is physically quite tiring. I do all of my own maintenance, and always have a list of jobs to catch up with. Umm, maybe living on a boat with kids? There are a few of us around! If you’d asked that, I would have said that it’s a great life. Mine have grown up with an attitude to life that I’m proud of, outside a lot, comfortable with all sorts of people. The downside is that they grow! Mine were 11, 6 and 4 when we moved on, and took up a lot less space than they do now. And having a small space, no tv, and being in such a rural location were all elements which led to my eldest moving out when she was 18. But that’s no bad thing. She’s very independent, and has loved city life from the start. She has very happy memories (mostly!) of growing up on the boat, and it’s always a good story. 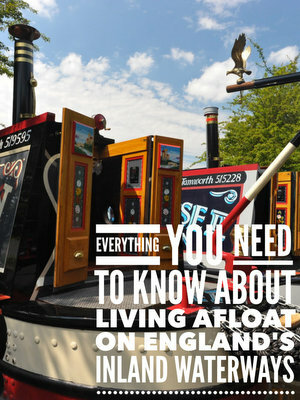 You can read about Sarah’s life afloat here.